Published in 2003, with a second printing in 2004, Isabel's book is certainly a worthwhile biblically presented reading for those of Spanish lineage. Isabel's own explanation of the content of her book is briefly paraphrased as follows: What is a ticket? It is a paper which allows the owner of same to enter an airplane, bus, or train, and in this story the train has been chosen. Why the train? The train is the vehicle which is used most often by people all over the world. But this train is different, it is the train of life and where will this train take you? There are only two places this train can take you - eternal punishment or eternal life (Matthew 25:46). 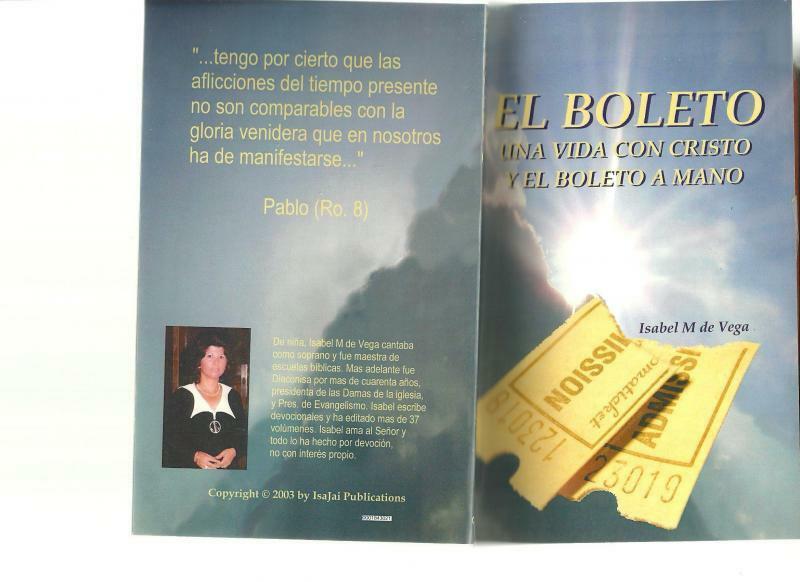 "UNA VIDA CON CRISTO Y EL BOLETO A MANO"
Copies of this book can be obtained by calling 386-437-1941 or by e-mail churchofchristflagler@gmail.com.